Earn 4.2 SB per $ when you buy Buffalo Wild Wings gift cards at MyGiftCardsPlus, powered by Swagbucks. Buffalo Wild Wings restaurants feature a variety of boldly flavored, made-to-order menu items including our namesake Buffalo, New York-style chicken wings. Our menu specializes in 21 mouth-watering signature sauces and seasonings with flavor sensations ranging from Sweet BBQÂ® to Blazinâ€™Â®. Guests enjoy a welcoming atmosphere that includes an extensive multi-media system for watching their favorite sporting events. 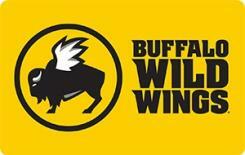 Buffalo Wild Wings is the recipient of hundreds of â€œBest Wingsâ€? and â€œBest Sports Barâ€? awards from across the country.